Ecoplaya Beach Resort: This timeshare destination, popular with Americans and Costa Ricans alike, is located on a remote peninsula jutting out into the Pacific Ocean of Bahia Salinas, Guanacaste Province. The closest town, La Cruz, is about 30 minutes away on a bumpy and pot-holed dirt road, and Nicaragua lies just across the bay. This is a great destination for people who want to get away from the mobs of tourists, relax on a quiet beach (you may be the only one there! ), and get to know more about the Costa Rican culture (La Cruz itself sees very few tourists and not too many people speak English). The staff are friendly, the food is decent, and tours can be arranged to nearby attractions (Humberto, the tour guide, was great!). Nicaragua Day Tour: Although we came to see Costa Rica, this trip across the border was one of the highlights of my trip. In contrast to Costa Rica, which sees many tourists and the average resident earns about $400 per month, Nicaragua has a much smaller tourism industry and the average resident lives on $2 a day. Tip: If crossing the border from Costa Rica, going with a tour guide is a must, as most Costa Rican rental car companies will not insure cars in Nicaragua and theft is common. Also, allow at least one hour to go through the standard immigration procedures. In Nicaragua, we shopped at handicraft markets in both Catarina and Masaya. The Catarina market is much less touristy, so you can get much better deals. In Masaya, we ate lunch at El Filete (the seafood was the best) and visited Masaya Volcano National Park. It is recommended that you visit the volcano for only 20 minutes, as the toxic fumes constantly being emitted can be hazardous to your health. We also visited the colonial city of Granada, although we didn’t have nearly as much time to explore this interesting city as I would have liked. Not big on shopping, my husband and I used most of this time to make friends with the locals. 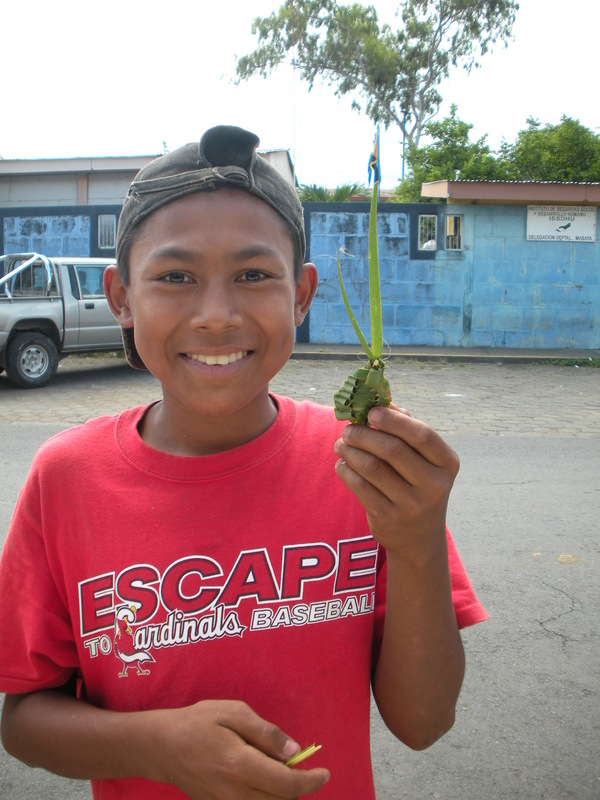 Here's a young boy we met at Masaya market. He made us the palm bug he's holding as a gift. While in Nicaragua, we were greeted by a deluge of rain, which our tour guide noted was ‘uncommon.’ It wasn’t until the next day that we learned it was the effects of Tropical Storm Ida – a bit of a humbling/frightening experience to learn that the locals had no warning of the storm that went on to kill 91 people in El Salvador and gain widespread news coverage in the United States. Rincon de la Vieja National Park: This national park is known for its natural beauty and volcanic activity. Hacienda Guachipelin, just outside the park, organizes day-long and multi-day adventure tours. The package we opted for included horseback riding, white-water river tubing and a canopy tour (although I have to admit I backed out of the canopy tour). To relax after a full day of adventure, we headed to Simbiosis Volcanic Mud Springs & Spa for sauna, mud bath and hot springs. Bolanos Island National Wildlife Refuge: Located about 1 mile via kayak from the beach at Ecoplaya, this 25 hectare island preserve is home to hundreds of sea birds and giant seashells. Swimming is good in the clear waters on the island’s beach, and we even saw some jumping fish and an unidentifiable water mammal partway across the bay. Be forewarned, the kayak trip is tricky when it’s windy on the bay. My husband and I really struggled on the kayak trip back. The bay between Ecoplaya's Beach and Bolanos Island may look calm and easy, but definitely not during a storm! Hotel Arenal Springs Resort: This resort is located about 7 km from La Fortuna, the closest city to Arenal Volcano. Although Arenal is technically the third most active volcano in the world, we didn’t witness any magnificent eruptions or lava flows during our 2 nights there. The rooms at this resort are nice, the restaurant food is near excellent, and each room comes with your very own view of Arenal Volcano if it’s not too cloudy (and your very own tropical garden shower in each room). This hotel seemed very popular with older people and tour groups, so we didn’t really fit in but enjoyed the surroundings. Puerto Viejo: During our second week, we headed to the Caribbean coast to the town of Puerto Viejo, near the Panamian border. I arranged a mini package through Gecko Trail Adventures, which included transportation to and from Arenal, 3 nights hotel accommodation, and some meals and activities. In Puerto Viejo, we stayed at Hotel Banana Azul, a funky, 12 room guesthouse with lots of personality. We were about 2 minutes from the beach, and a 30 minute walk from town along the beach. The restaurant had great food and was very reasonably priced. While there, we more than enjoyed the bar. Franklin, the bartender, makes excellent margaritas and mojitos from scratch. A visit to the Aviarios Sloth Sanctuary, which takes in injured and orphaned sloths and educates tourists and Costa Rican school children about this unique creature. A visit to Cahuita National Park. Here, it was definitely worth the $15 per person to hire a local tour guide to point out the hard-to-see wildlife and tell us about the unique flora of the park. A visit to an indigenous family’s home near Bribri, where they make chocolate and other products from the cacao fruit. A young BriBri girl showed us how they make chocolate. Most of the bars we bought were not very sweet and had a high cacao content - my favorite! A couples’ massage a Pure Jungle Spa, where the name says it all. Dinner at Jungle Love Garden Cafe – the marlin here was excellent and they also have a good selection of vegetarian options. Our last major activity in Costa Rica was white water rafting on the Pacuare River. Many tour companies run day trips, but we opted for one run by Exploradores Outdoors, who also offers transport between the Caribbean, Arenal, or San Jose (so it’s a great activity to do in transit). This is a Class III-IV river, so it’s a bit rough, but no prior experience was required. Fortunately, our raft didn’t tip over, but this required a great deal of team work and following directions from our guide! This entry was posted in Becky's Adventures and tagged adventure travel, Costa Rica, Nicaragua. Bookmark the permalink.